Summer is fast approaching! Everyone will be hyped and excited again to flaunt their perfect beach bodies. Well, summer is not only for those who have perfect bodies, right? It is for all; no matter what body type we have. So pack your things and hit the beach! It’s time to chillax, enjoy and beat the heat! But wait, it is expected that the most common tourist destination during summer will be the beach. Be prepared for the huge crowd of tourists and locals will flock to most beaches during the hottest months of the year. If you are one of those people who are not a fan of crowded places, any secluded mountain resorts, pools, and waterfalls can be a good summer destination alternative. Cebu has a lot to offer when talking about beaches and waterfalls. It has more than a hundred waterfalls and numerous white sand beaches. 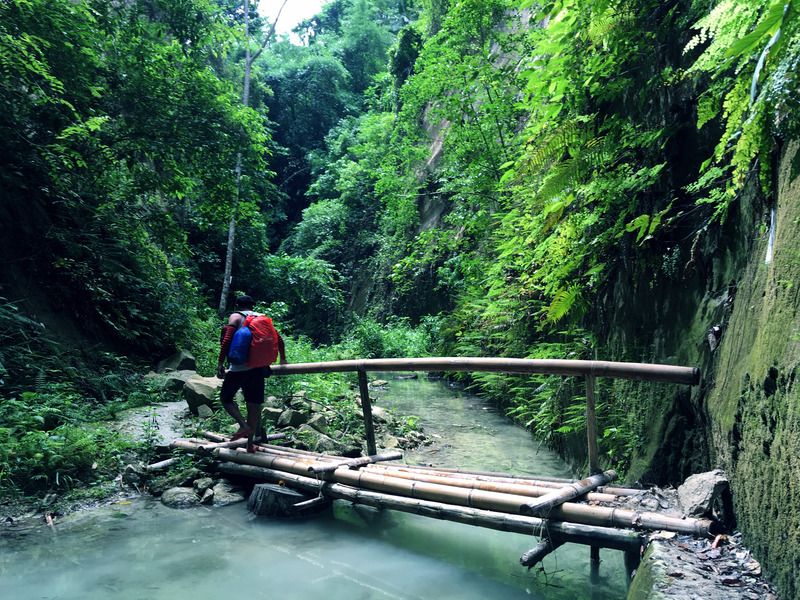 Cebu south has established a name in terms of beaches and waterfalls. We’ll, this time, I will not be talking about mountains. 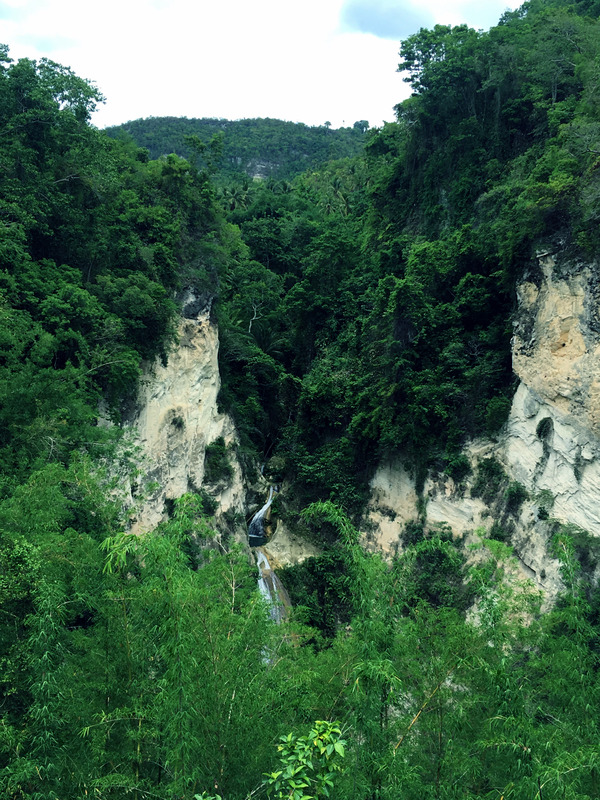 We’re going to talk about one of the municipalities in Cebu South that has several waterfalls. Let’s start with the town of Samboan. Samboan is a 5th class income municipality located approximately 150 kilometers from Cebu City. It is composed of 15 barangays and is located right next to Ginatilan. Samboan is rich in cultural heritage left by Spanish conquerors. In fact, one of the oldest Spanish-built churches is still intact in the heart of Samboan, the St Michael Archangel Church wherein the church façade is made up of coral stones. Other Spanish structures that the town can boast of are the Watch Tower, St Jacob’s Ladder, San Sebastian Stone Walls and the World War II Volunteers Monument. Another thing that this laid back town can be proud of is the attraction sites that it can offer to both local and foreign tourists alike. 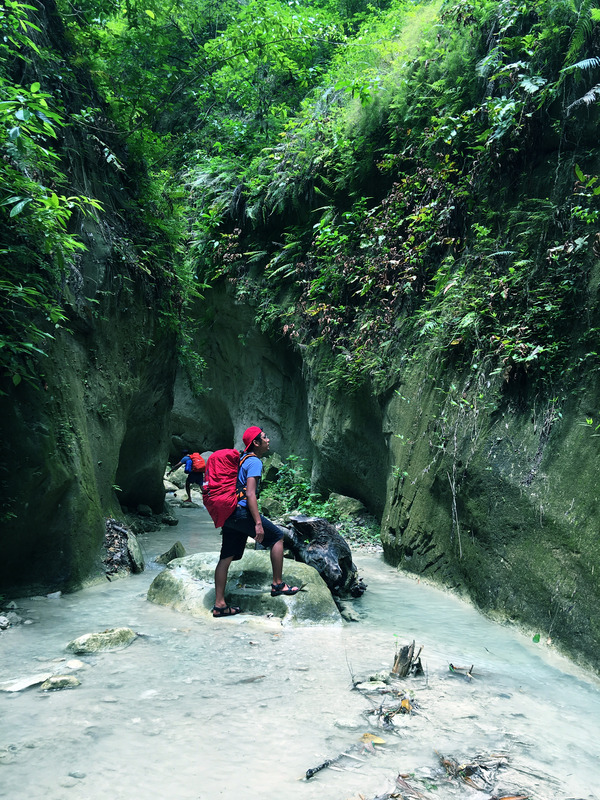 The town boasts its’ Colase Marine Sanctuary, Ponong Hidden Lake, Mount Bartolina and the infamous six waterfalls scattered within the municipality’s jurisdiction. 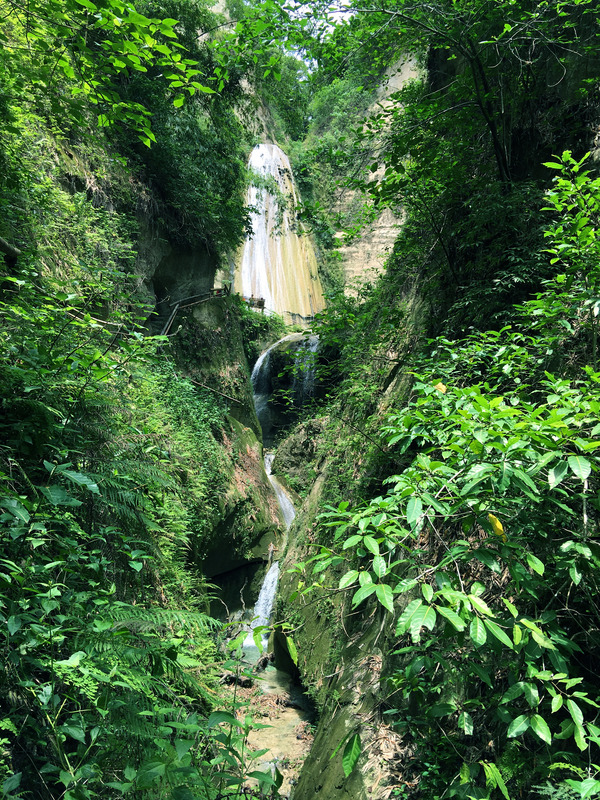 Samboan is blessed with these six waterfalls (at least known to tourists) namely: Aguinid, Bonbon, Balay sa Sawa, Dao, Kandayvic and Tabon. Aguinid has 5 tiers, Bonbon has the triple drop, Balay sa sawa has the bigger lagoon for swimming, Dao is the highest and Tabon is the recently developed spot between Tangbo and Bonbon. Dao falls is located in barangay Suba, Samboan. Our entry point going to Dao is from the Kandayvic Falls. We ambled along the mountain path going down to Dao Falls. We walked through a footpath of loose soil in a parched field which is used by the locals as a corn field. It was a bit of steep ascent and muscle flexing one. The antagonistic and fiery heat of the midday sun was trying to scorch us. But nothing can stop the adrenaline junkies and the waterfall chasers. We then followed the path less trodden, a trail where only locals use as an access path to their farm. Few moments after, we began to hear an unusual humming sound that vibrated around like a wind breeze overpowering the cracking sounds of the bamboos nearby. The sound traveled through my body and I felt a tingle that runs through my arms to my fingertips. Sometimes it sounded like bees swarming through the flower farm. Then the buzzing transferred to the rocks beneath our feet like echoes calling us to come. As we round up below, the source of the sound revealed itself. Wow! The vista is so amazing! Impeccable! It was a chirruping waterfall, the majestic Dao Falls! From a distance, the falls looked like silver tear tracks on the furrowed face of the mountain. It was tiered and plunged into the depths of a turquoise lagoon. It is worth noting that the other side of the mountain seems really a good spot for rappelling too. We hurriedly went down below as the falls were calling us to hurry. LOL. Well, after a few snaps of course. Aside from being the highest waterfall in Samboan, Dao Falls proved its splendor among others. Same with other waterfalls, you’ll get to have a short river trek going to the falls lagoon. We walked along the edge of the rocks towards the swollen noise of the large drop of water to the turquoise pool ahead. As we began to get closer, the uproar of the cascade increased. It was growling and reverberating. Then it foamed into a lather at the base. The waterfall seemed to fuse itself into distinct threads of watery fabric as we approached. It was as if a loom of liquid silver was pouring down the rocks. The sound was dissonant now. The water falling streamed into one infinity pool of bliss and hitting the vast hollow of the turquoise lagoon like a thunderclap. The pool of this cold waters fed the other smaller waterfall tiers below. We had a quick dip in the lagoon and a few snaps of the place. The locals advised us not to stay long as the weather was getting unpleasant. They told us to be careful as flash floods may happen anytime when it rains. We then bid our goodbyes to the King of Falls as the dragons inside our tummies went wild already. It was past 1 in the afternoon, though. As we part ways with the mighty Dao, the buzzing sounds changed to a gentler swoosh-plunk and hiss-plop. It was still a volley of sound, but it had a gentler slushiness to it. It’s a bit hard to leave this beautiful creation but we need to, as the dragons inside our tummies really wanted to get loose. We had our quick beverage break at the entrance to quench our thirst. Then we took a trike going to the highway. We have had our late lunch and headed back to the city after. Though our time spent with Dao Falls was shortened, but it was worth the painstaking trek to the falls. The impeccable and majestic vista was worth it. I would really love to go back here and stay a bit longer. Next time, I would be bringing a wide angle camera, with a fisheye lens to be exact to capture this magnificent view. A drone would be better, though. How about you? Have you been to Dao Falls or any other waterfall in Samboan? How was your experience? Share your thoughts below. 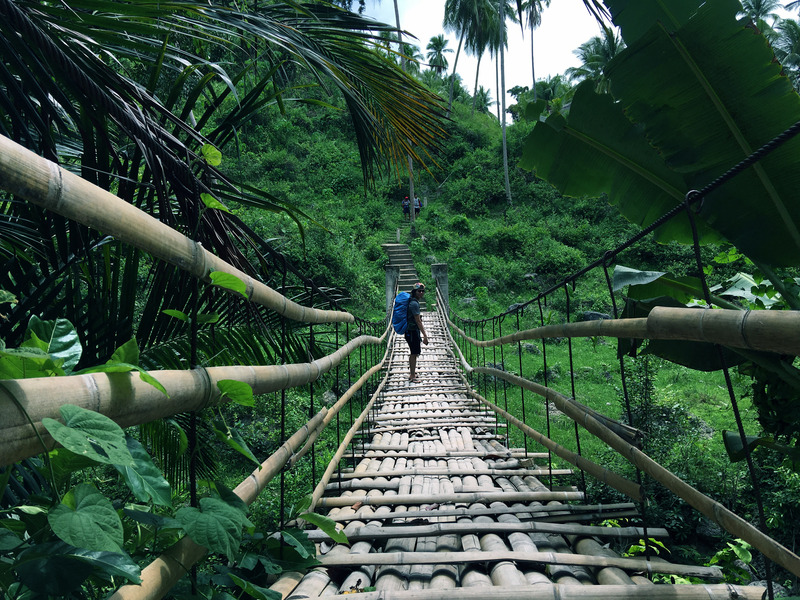 Going to Samboan is relatively an easy one. From Cebu South Bus Terminal (CSBT), take a bus bound to Samboan or with the sign Bato via Barili. Tell the bus conductor to drop you off at the Municipal Hall. If you don’t know the place yet, proceed to Samboan Tourism Office to ask for assistance. Mode of transportation to the jump off is through habal2x or motorcycle taxi. Most habal2x drivers know where the entrance to Dao Falls is. Waterproof your things/valuables. Better use a dry bag if you have one. Be prepared for the fiery heat of the sun as the trail going to the falls is an open parched field during summer. Pack light but don’t forget to bring water, sunscreen/protection, waterproof bags for gadgets, swimming attire, slippers or sandals. If you are not sure how deep is the pool below the falls, do not attempt to dive immediately. Know how deep it is first. Leave nothing but footprints. Do not leave your trash behind. It’s majestic!! I always get excited when I hear the roaring sound of the waterfalls. I haven’t been to Samboan at all but soon enough, I’m pretty sure I’ll also get to visit. The nice thing about not staying too long is the excitement of knowing that you will be back someday. hala ha ngano ako manang pinaka-una na picture? hahahaha! 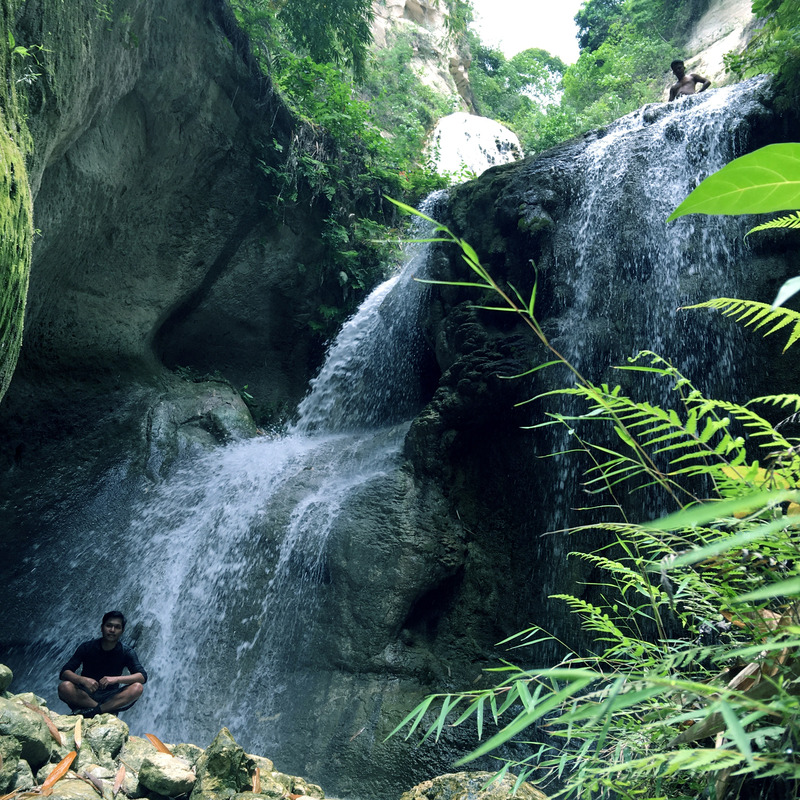 Dao falls is one of the best waterfalls in Cebu. 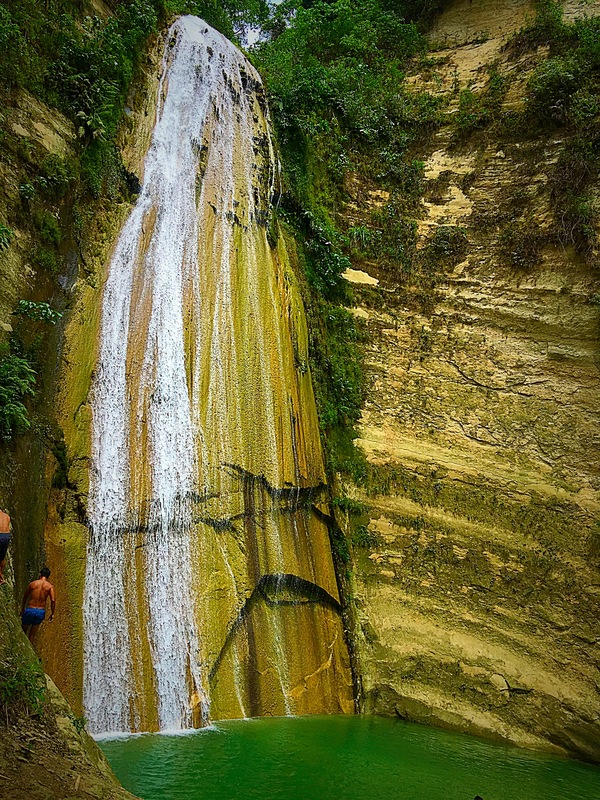 Comes with a great adventure going to the source that gets rewarded when arriving at the waterfall. 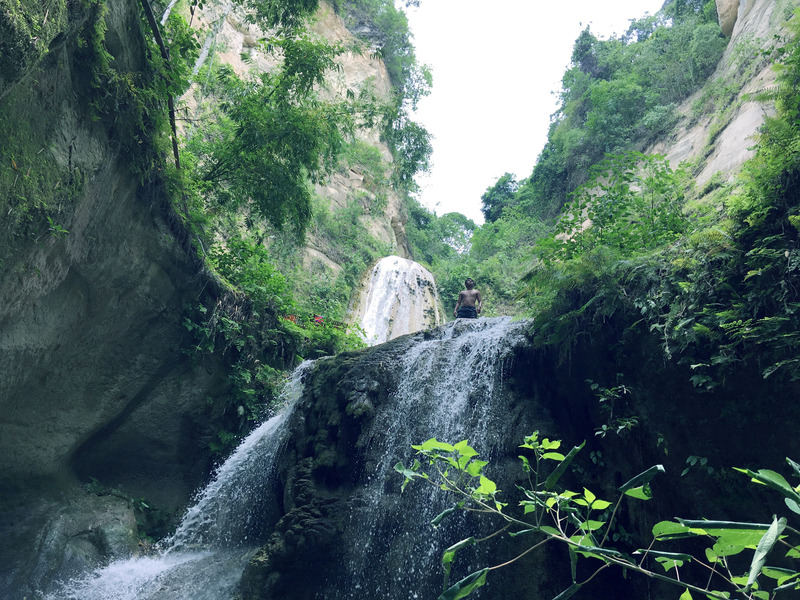 Dao Falls definitely deserves to be described as one of the majestic waterfalls in Cebu. It’s so near Santander, but I haven’t been there yet. Hopefully, I can finally visit it one of these days. I’m soooooo excited for our trip this weekend now. Got to download an offline version of this page for the tips. Breathtaking! It’s been quite a while since I’ve been to a falls. I miss hearing the sound that it makes and the cool sort of mist that surrounds it. I ought to go on a trip with some friends one of these days! Ohhh so much green but I ain’t complaining! From the name itself palang, majestic! This is one of my favorite falls in Cebu. I feel at home here. I can even stay here the whole day and just sleep in the water. Hahaha! These nature and waterfalls pictures are very beautiful! I hope I can visit places like this in my lifetime. Thanks AJ for the very informative article and tips. Nindota uy. Laag niya ta dira pleaseeeeee. Tigom sa ko moneyyyyy. Waaaaa! I like all your pictures of Dao Falls! They make me want to go there now!!! Sure enough, if moadto ka og falls unya dili ka maligo kay sayang kaayo. Nindot gyod ituslob sa tubig ug malingaw. It’s a nice experience to dip yourself sa katugnaw sa tubig aron mahuwas-huwasan mo sa kainit sa paglakaw.